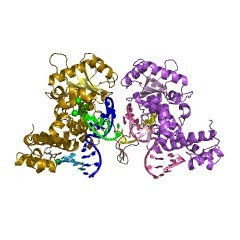 Differences in the substrate specificity of mammalian family X DNA polymerases are proposed to partly depend on a loop (loop 1) upstream of the polymerase active site. To examine if this is the case in DNA polymerase lambda (pol lambda), here we characterize a variant of the human polymerase in which nine residues of loop 1 are replaced with four residues from the equivalent position in pol beta. 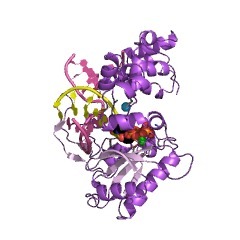 Crystal structures of the mutant enzyme bound to gapped DNA with and without a correct dNTP reveal that the change in loop 1 does not affect the overall structure of the protein. Consistent with these structural data, the mutant enzyme has relatively normal catalytic efficiency for correct incorporation, and it efficiently participates in non-homologous end joining of double-strand DNA breaks. However, DNA junctions recovered from end-joining reactions are more diverse than normal, and the mutant enzyme is substantially less accurate than wild-type pol lambda in three different biochemical assays. Comparisons of the binary and ternary complex crystal structures of mutant and wild-type pol lambda suggest that loop 1 modulates pol lambda's fidelity by controlling dNTP-induced movements of the template strand and the primer-terminal 3'-OH as the enzyme transitions from an inactive to an active conformation.